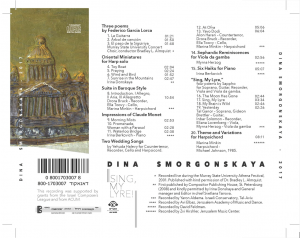 suite for strings based on Ladino songs (2011). Finding an appreciative audience in her new/ancient homeland, Dina Smorgonskaya was awarded the Prime Minister’s Prize for Composers in 2005. Greatly valued also in Russia, her music is still performed there, as well as in the USA, Canada and other countries. Whatever the genre in which Smorgonskaya works, or whether th e images are of a lyrical or rebellious spirit, her compositions are distinguished by a classical clarity of musical ideas, refined associative metaphors and a strict perfection of form. Not restrained to any of the “modern” techniques, she offers artistic designs in whatever musical expression they require. 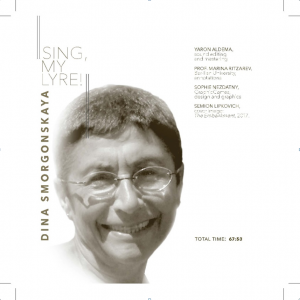 This album, Sing, My Lyre!, represents mostly a chamber music selection from Smorgonskaya’s legacy, both instrumental and vocal, as well as including one of her choral compositions. The prevailing mood of these scores is one of a delicate shyness and reverence for the beauty of poetry and the arts, at times suggestive of contemplation, while often referring to images of the baroque epoch. Smorgonskaya creates an emotional, personal, artistic dialogue with the poetry and arts of the past, from which she seems to draw inspiration. A positive and warm aura colours her tones and conveys a meditative quiet wisdom that seems to offer a companion to the arts, existing whether in reality or in our memory.